PREMIER 4WD!! NAVIGATION!! SUNROOF!! DUAL DVD!! POWER RUNNING-BOARDS!! ADAPTIVE CRUISE CONTROL!! BLUETOOTH!! BACK-UP CAMERA!! POWER FOLDING 3RD ROW!! 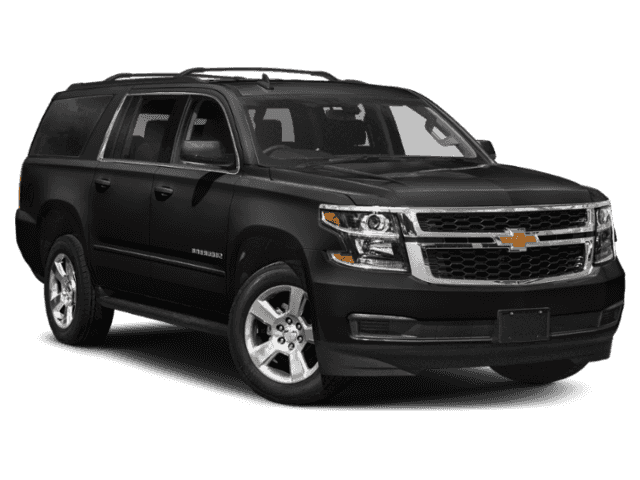 2018 CHEVROLET SUBURBAN PREMIER 4WD, BLACK ON JET BLACK HEATED/COOLED LEATHER SEATING, 5.3L V8 ECOTEC3 ENGINE UNDER THE HOOD, 6-SPD AUTOMATIC TRANSMISSION, 22 HWY MPG!! LETS GO OVER ALL THE OPTIONS ON THIS ALPHA DOG OF THE SUBURBAN WORLD!! 8 COLOR TOUCH SCREEN W/ NAVIGATION AND APPLE CARPLAY CAPABILITY, POWER GLASS SUNROOF, 2ND AND 3RD ROW DVD ENTERTAINMENT SCREENS FOR YOUR SPONGEBOB WATCHERS!! 20 POLISHED ALUMINUM WHEELS, HEAD-UP DISPLAY, REMOTE STARTER, ADAPTIVE CRUISE CONTROL, PASSIVE ENTRY SYSTEM W/ PUSH BUTTON START, BLUETOOTH FOR PHONE, POWER FOLDING 3RD ROW, 4G LTE WI-FI, 11 SPEAKER BOSE SURROUND SOUND, LAND CHANGE ALERT W/ SIDE BLIND ZONE ALERT, FORWARD COLLISION ALERT, REAR CROSS TRAFFIC ALERT, HEATED STEERING WHEEL W/ AUDIO CONTROLS, MAGNETIC RIDE CONTROL SUSPENSION PACKAGE, POWER HANDS FREE LIFTGATE, HEATED 2ND ROW SEATING W/ CAPTAIN CHAIRS, WIRELESS CHARGING FOR SMART PHONES, POWER ADJUSTABLE PEDALS, POWER RUNNING BOARDS, MAX TRAILERING PKG, TRIZONE CLIMATE CONTROL, ALL LOADED UP AND LOOKING FOR A NEW FAMILY TO HAUL AROUND TOWN!! BUT WAIT SUBURBAN SHOPPERS…WE HAVE MORE!! YOU GET THE REMAINDER OF THE 36 MONTH OR 36,000 MILE BUMPER TO BUMPER COVERAGE GOOD FROM UNTIL 02/25/2022 OR 36,000 MILES, PLUS 5 YEAR OR 60,000 MILE POWERTRAIN COVERAGE GOOD UNTIL 02/25/2024 OR 60,000 MILES… WORRY FREE DRIVING….ALL ABOARD!! 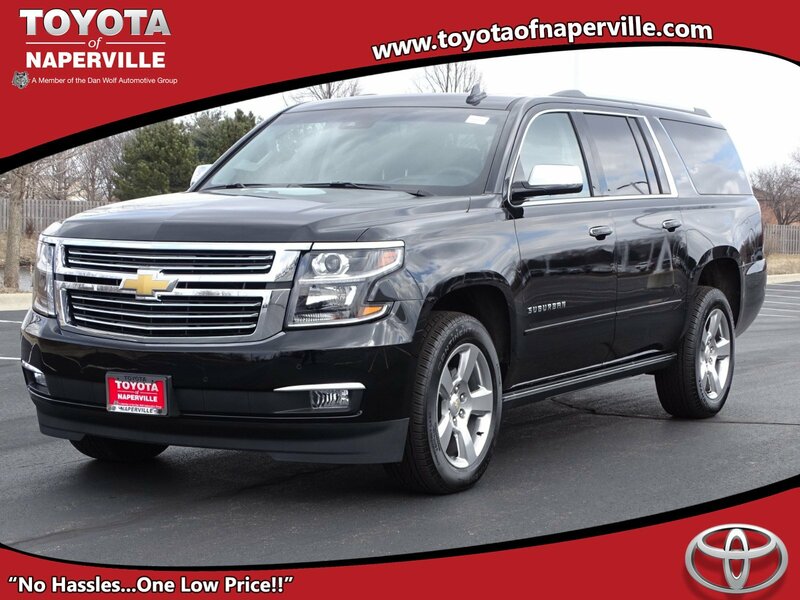 COME ON IN TODAY AND TAKE THIS LOADED UP SUBURBAN FOR A SPIN AROUND OUR TOYOTA OF NAPERVILLE TEST TRACK!! FIND NEW ROADS HERE AT TOYOTA OF NAPERVILLE!! PREMIER 4WD!! NAVIGATION!! SUNROOF!! DUAL DVD!! POWER RUNNING-BOARDS!! ADAPTIVE CRUISE CONTROL!! BLUETOOTH!! BACK-UP CAMERA!! POWER FOLDING 3RD ROW!! 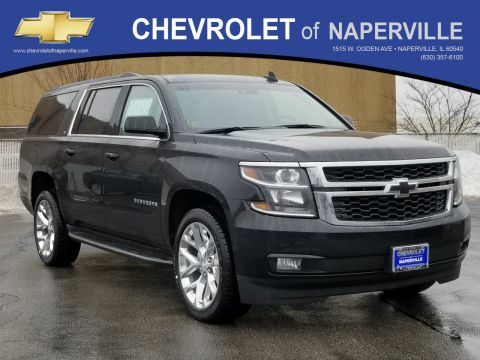 2018 CHEVROLET SUBURBAN PREMIER 4WD, BLACK ON JET BLACK HEATED/COOLED LEATHER SEATING, 5.3L V8 ECOTEC3 ENGINE UNDER THE HOOD, 6-SPD AUTOMATIC TRANSMISSION, 22 HWY MPG!! LETS GO OVER ALL THE OPTIONS ON THIS ALPHA DOG OF THE SUBURBAN WORLD!! 8 COLOR TOUCH SCREEN W/ NAVIGATION AND APPLE CARPLAY CAPABILITY, POWER GLASS SUNROOF, 2ND AND 3RD ROW DVD ENTERTAINMENT SCREENS FOR YOUR SPONGEBOB WATCHERS!! 20 POLISHED ALUMINUM WHEELS, HEAD-UP DISPLAY, REMOTE STARTER, ADAPTIVE CRUISE CONTROL, PASSIVE ENTRY SYSTEM W/ PUSH BUTTON START, BLUETOOTH FOR PHONE, POWER FOLDING 3RD ROW, 4G LTE WI-FI, 11 SPEAKER BOSE SURROUND SOUND, LAND CHANGE ALERT W/ SIDE BLIND ZONE ALERT, FORWARD COLLISION ALERT, REAR CROSS TRAFFIC ALERT, HEATED STEERING WHEEL W/ AUDIO CONTROLS, MAGNETIC RIDE CONTROL SUSPENSION PACKAGE, POWER HANDS FREE LIFTGATE, HEATED 2ND ROW SEATING W/ CAPTAIN CHAIRS, WIRELESS CHARGING FOR SMART PHONES, POWER ADJUSTABLE PEDALS, POWER RUNNING BOARDS, MAX TRAILERING PKG, TRIZONE CLIMATE CONTROL, ALL LOADED UP AND LOOKING FOR A NEW FAMILY TO HAUL AROUND TOWN!! BUT WAIT SUBURBAN SHOPPERS...WE HAVE MORE!! YOU GET THE REMAINDER OF THE 36 MONTH OR 36,000 MILE BUMPER TO BUMPER COVERAGE GOOD FROM UNTIL 02/25/2022 OR 36,000 MILES, PLUS 5 YEAR OR 60,000 MILE POWERTRAIN COVERAGE GOOD UNTIL 02/25/2024 OR 60,000 MILES... WORRY FREE DRIVING....ALL ABOARD!! 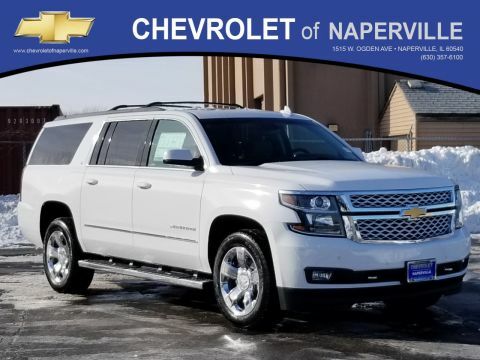 COME ON IN TODAY AND TAKE THIS LOADED UP SUBURBAN FOR A SPIN AROUND OUR TOYOTA OF NAPERVILLE TEST TRACK!! FIND NEW ROADS HERE AT TOYOTA OF NAPERVILLE! !